May 22, 2018 — An event and lecture honoring the spirit and memory of 2012 Grinnell College graduate, Armando “Mando” Alters Montaño, made for an emotional and thought-provoking evening. Writers@Grinnell hosted the second annual Armando Alters Montaño ‘12 Memorial Lecture April 10 at Grinnell College, which featured a reading by Stephen Kuusisto. Montaño, a gifted journalist, died at the age of 22 in June 2012 in Mexico City, where he was working as an intern for the Associated Press shortly after graduating from Grinnell. Dean Bakopoulos, director of Writers@Grinnell, started the event by talking about how Montaño was beloved at Grinnell by students, faculty, and staff. He also shared his own remembrances. His parents, Diane Alters ’71 and Mario Montaño, created the Armando Alters Montaño Writers@Grinnell Endowment Fund in 2015. The Class of 2012 supported endowing the fund through a fundraising effort during their 5th reunion in 2017. The fund supports the Writers@Grinnell program in memory of their son’s dedication to nonfiction and fiction writing, journalism, and the creative process. The endowment fund also provides staff members of The Scarlet & Black student newspaper with opportunities for alumni mentoring and networking as well as student internships in the areas of creative writing, publishing, television, film, and other media. For the past two years, the Armando Alters Montaño ’12 Memorial Reading has brought leading nonfiction writers to campus to speak. Kuusisto teaches at Syracuse University where he holds a professorship in the Center on Human Policy, Law, and Disability Studies. He is a graduate of the Iowa Writer’s Workshop, a Fulbright Scholar, and the author of several memoirs and poetry collections, including the memoir Planet of the Blind, which was a New York Times Notable Book of the Year. 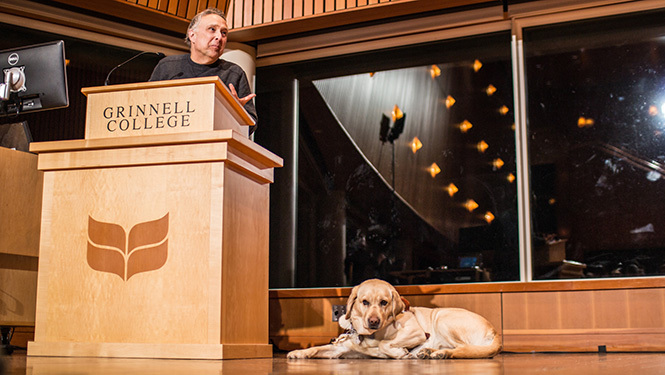 Author Stephen Kuusisto reads from his book while Caitlyn, a yellow Labrador guide dog, looks on. 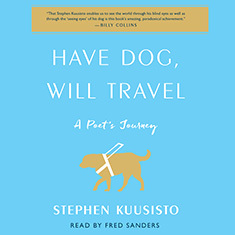 With his new memoir, Have Dog, Will Travel, Kuusisto — who was born legally blind — tells the story of working with his first guide dog, a yellow Labrador named Corky, and the incredible adventure that began when new doors were suddenly opened to him thanks to this second pair of eyes. In addition to the lecture, Kuusisto and Tessa Cheek ’12 had a roundtable discussion with Grinnell students earlier that day about creative nonfiction. Cheek is a writer, reporter, and candlestick maker living in Ridgway, Colorado. The hour-long lecture video includes a tribute to Montaño by Bakopoulos; the introduction of the speaker by Ralph Savarese, professor and chair of the Grinnell College English Department; Kuusisto’s reading; and a question-and-answer session. Learn more about the inspiration behind Diane Alters ‘71 and Mario Montaño’s establishment of the Armando Alters Montaño ’12 Writers@Grinnell Endowment Fund.